18886 EA GUADELOUPE (1935) Victor Hugues with spyglass and Corsairs*. 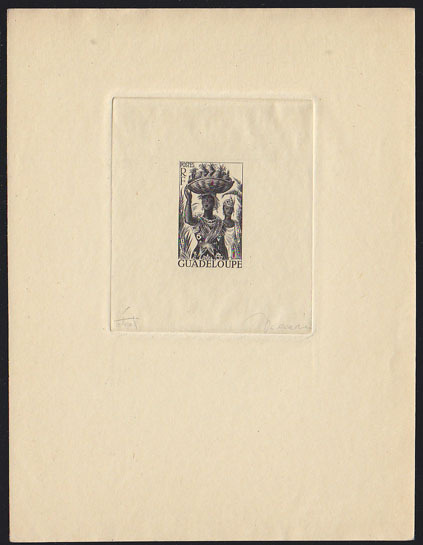 Die proof in green signed by the engraver MIGNON. Scott No 148, Yvert No 131. A very rare proof! 19142 EA GUADELOUPE (1935) Cardinal Richelieu establishing Antilles Company*. Stage die proof in violet missing value. Scott type A14. 19143 EA GUADELOUPE (1935) Cardinal Richelieu establishing Antilles Company*. 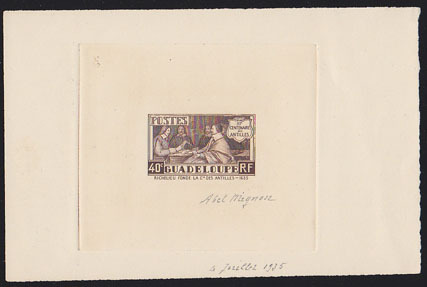 Die proof in brown signed by the engraver MIGNON. Scott No 142, Yvert No 127. A very rare proof! 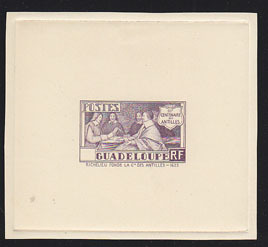 18799 EA GUADELOUPE (1947) Pineapple bearer*. Stage die proof in black omitting the value signed by the engraver DECARIS. Scott type A21. 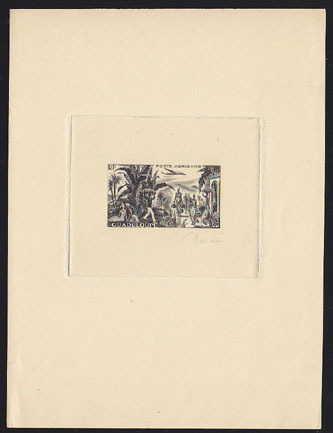 18802 EA GUADELOUPE (1947) Gathering bananas*. Die proof in black signed by the engraver DECARIS. Scott No C10, Yvert No PA13. 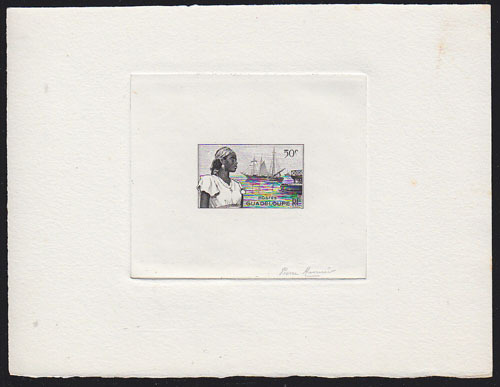 18890 EA GUADELOUPE (1947) Bas-Terre harbor*. Woman*. 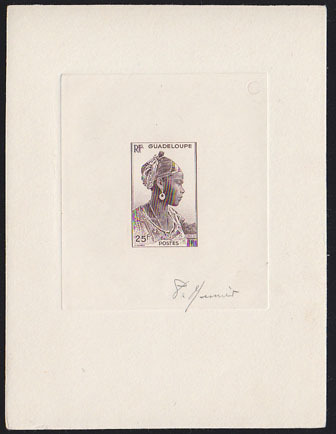 Die proof in black signed by the engraver MUNIER. Scott No 191, Yvert No 199. 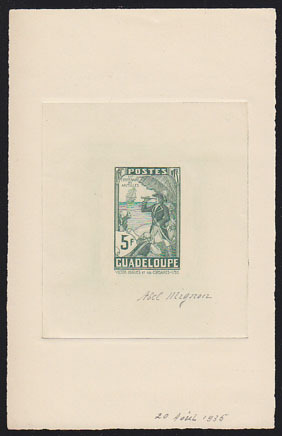 19127 EA GUADELOUPE (1947) Guadeloupe woman*. Die proof in blue signed by the engraver SERRES. Scott No199, Yvert No 27. 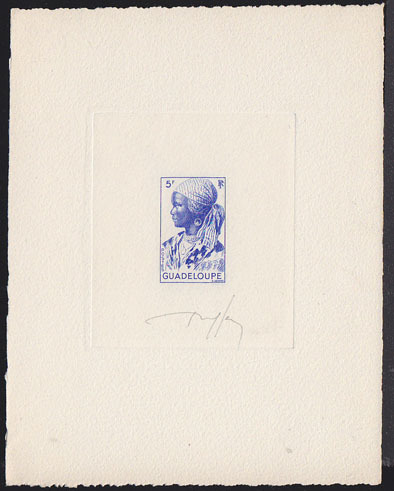 19128 EA GUADELOUPE (1947) Guadeloupe woman*. Die proof in sepia signed by the engraver. Scott No 204, Yvert No 212.